India, Japan, and other aspirants to permanent membership of the Security Council would be na?ve to imagine others would support extension of the veto power. INDIA AND Japan are tilting at windmills in demanding that the enlargement of the United Nations Security Council (UNSC) include extension of the veto to the proposed new permanent members. Apart from being unrealistic, the demand for veto power shows the two countries have not correctly understood the reason why the majority of the world wants the Security Council to be reformed in the first place. Most nations - barring a handful like Israel who have been the beneficiary of vetoes - consider the veto power of the five existing permanent members (P-5) to be profoundly undemocratic. India, Japan and other aspirants to permanent status would be na?ve to imagine that others would support the extension of this privilege to a handful of rising powers. Indeed, the greater the emphasis on the veto, the greater will be the suspicion that what Japan and India are really after is not the democratisation of the U.N. but their own accommodation in an unequal set-up. All states look to further their interest and it is hardly surprising that India and Japan would seek to do the same. But what’s sauce for the goose is sauce for the gander. Other countries, too, will look out for what’s best for them. 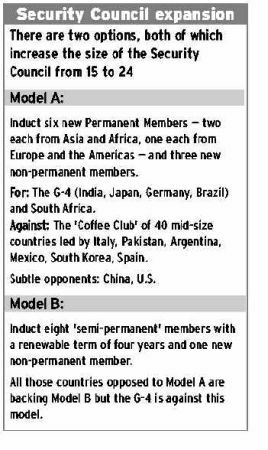 And there is no doubt that medium-sized or small countries will back Model B - which adds eight new semi-permanent members with four-year terms but no new permanent ones. Given the high degree of consensus with which the African Union operates, virtually every state in Africa can nurture the hope of becoming a semi-permanent member for at least one term of four years. And in Latin America, Europe and Asia too, many countries would feel they have a fair chance of occupying a Model B seat at some point. In contrast, Model A gives them nothing. Indeed, getting Model A past the U.N. general Assembly will be a tough enough task for the G-4 without them muddying the waters by demanding the veto. What India and Japan need to do is make a virtue of out of necessity by building on the world’s opposition to the veto and proposing that the UNGA demand its abolition. Once the P-5 oppose this, as they surely will, a compromise formula should be proposed whereby the ability of the non-permanent, non-veto wielding members to restrain the UNSC from acting in particular ways is strengthened. The `veto power’ exercised by the P-5 flows directly from Article 27 of the U.N. Charter, which specifies the voting procedure for adopting resolutions. Decisions on "procedural matters" are made by an affirmative vote of nine (out of 15) but "on other matters" the affirmative vote of nine must include the "concurring votes of the permanent members." Though the veto is wielded much less today than it was during the Cold War, the power to block resolutions is still routinely exercised. The worst offender, of course, is the U.S., which is responsible for 70 per cent of vetoes cast since 1986, most of them to bail out Israel. The two Chinese vetoes - of U.N. observers to Guatemala and a U.N. force for Macedonia - were linked entirely to these two countries recognising Taiwan. Correctly understood, the veto is not so much a positive power as a negative one: A country with a veto only acquires the power to restrain the UNSC from acting in a particular manner. In order to pass a resolution, however, a permanent member must convince (or arm-twist) at least eight other members to vote yes. As the failure of the U.S. to win support for its illegal invasion of Iraq in February 2003 demonstrated, this is not always an easy matter. Curiously, none of the models for UNSC enlargement have suggested what the number of votes needed should be for a resolution to be passed. A pro rata application of the current 9 out of 15 ratio would suggest that at least 15 positive votes are needed to get a resolution passed in a council of 24. India and Japan should propose that if the P-5 are not willing to give up their veto power, they should at least agree to raise the bar for a resolution - especially Chapter VII resolutions authorising sanctions, the use of force or the prosecution of cases in the International Criminal Court - to 18 or 19 positive votes. This way, resolutions dealing with international peace and security would require a higher degree of consensus and reduce the ability of the P-5 to get the UNSC to act in a partisan or politicised manner. This would still be an imperfect solution. But were India and Japan to steer the debate in this direction, they would find greater support for their candidature in an enlarged Council.